When choosing toys for the quads, my favorites inspire imaginative play, problem solving, and creativity. 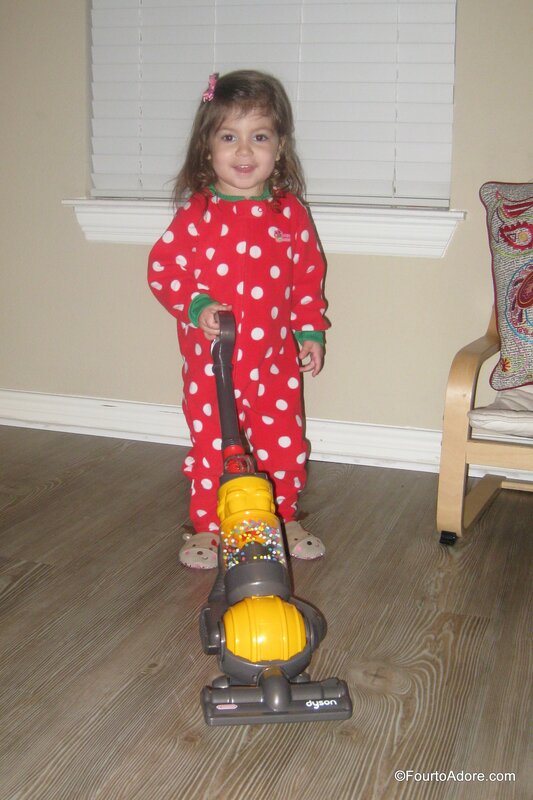 Consequently, I was pleased when they received a Dust, Sweep and Mop set from a friend for their second birthday. At first, they seemed to think this toy was best suited for swashbuckling so I safely tucked it away, and temporarily forgot about it. A couple of weeks ago, I rediscovered this toy and demonstrated how to use it. In fact, the crew happily “helped” me tidy up for a party we were hosting. 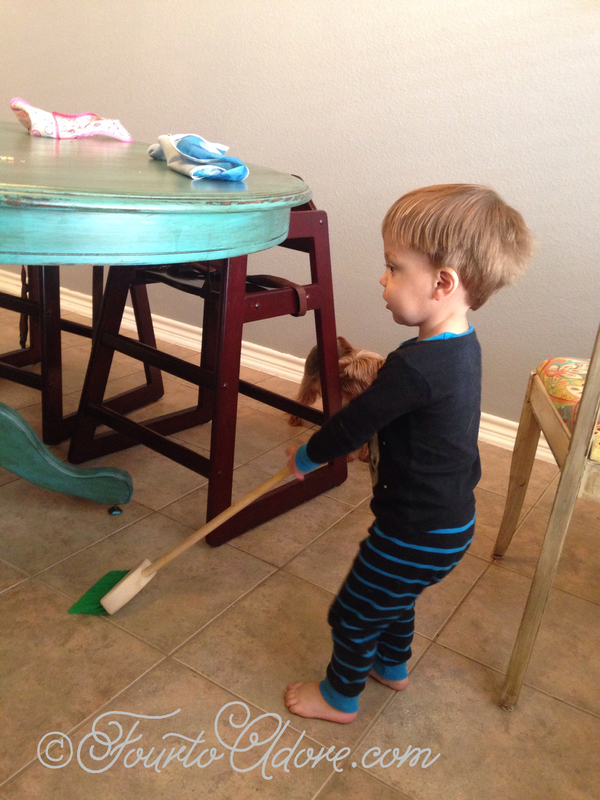 Later in the week, my heart exploded with joy when Mason independently pulled all of the chairs from our kitchen table to sweep the crumbs below. This particular not only inspired imaginative play, it encouraged chore completion, a major win in my book! I was delighted when Casdon’s Toy Dyson Ball Vacuum arrived for the quads to test drive since it is exactly the type of toy I prefer. 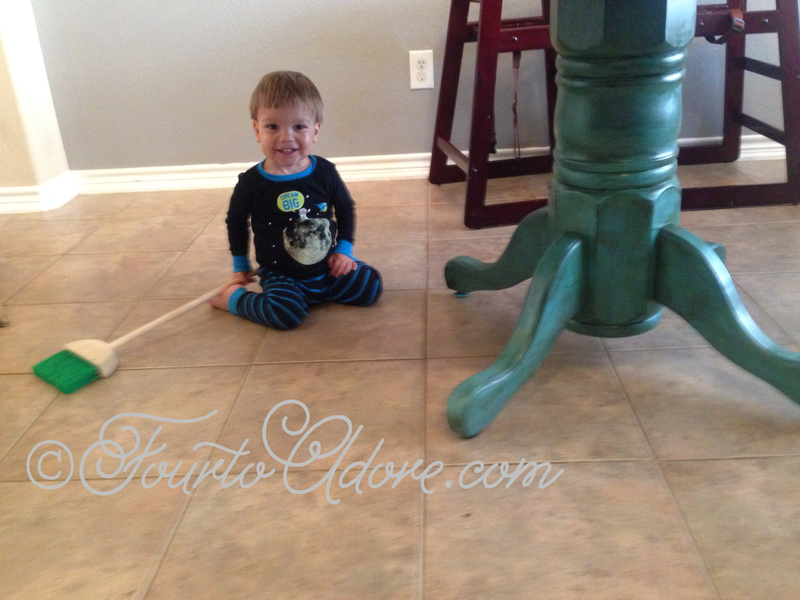 It encourages imaginative play while also helping the quads learn a valuable life skill. I planned to surprise the quads with it after bath time, but they spied it prematurely and squealed “It’s a vacuum!! !” I couldn’t squelch their desire to clean so we immediately opened the box and loaded the batteries. It only took about a minute to assemble and load the batteries, which was good because the quads were chomping at the bit. The biggest problem? There was one vacuum and four eager toddlers awaiting a turn. Toddlers are notoriously impatient, especially with new toys, but everyone got a turn before bath. The quads easily learned to operate switches and didn’t mind the realistic sounds. Thankfully, the toy is much quieter than my Dyson because when they hear me vacuuming, they cover their ears and whine. In addition to a colorful spinning cyclone, it also provides real suction from the base, which can pick up small bits of debris and dust. (Don’t get too excited though…remember, it’s just a toy so it won’t replace your vacuum.) The quads are a little young for to operate the removable dustbin independently, but they will learn in time. They did, however, try to remove the clear container on the front since that’s how I unload the dust from our actual Dyson. Toddlers really watch every single thing we do, which is good reason to model what we desire for them. The quads didn’t seem to notice, but I appreciated the gender neutral color since our boys and girls will be playing with this toy. Though the age range suggested on the box is three to eight, I think kids about 2.5 to 5 or 6 would be better suited for this toy. My kids aren’t quite three and adore it, and I suspect most eight year olds would find it a bit immature (or too small) for them. In fact, I’d be inclined to teach an eight year old how to operate our real Dyson as part of a chore chart. 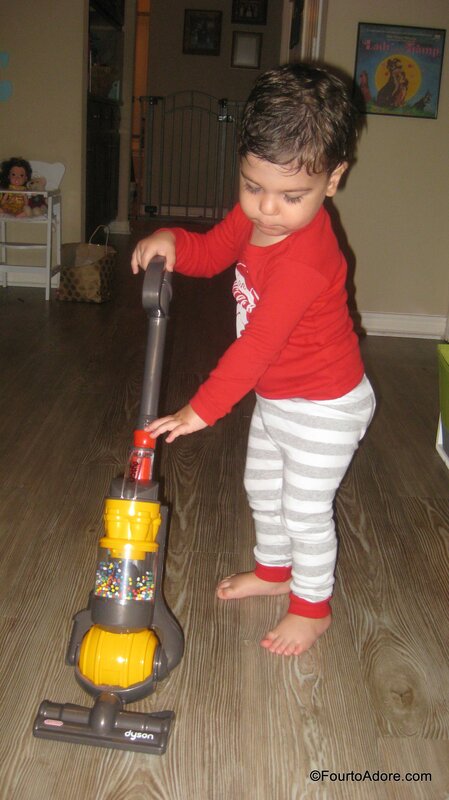 If you’re looking for a last-minute gift for a toddler or preschooler this year, consider the Casdon Toy Dyson, it’s quaddler approved! Disclaimer: I would like extend a special thanks Casdon for providing a Toy Dyson Ball Vacuum for us to try for the purpose of review. No other compensation was received, and all thoughts/ opinions are 100% my own. 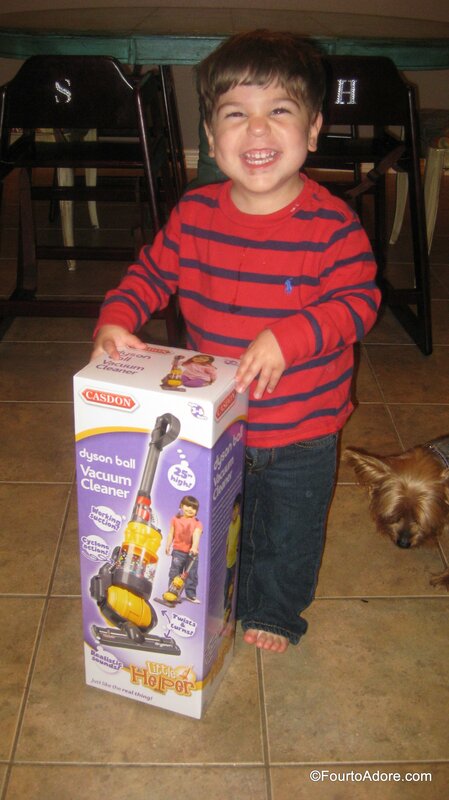 When my middle son was about 5 years old, we got a new vacuum cleaner. Matt was ecstatic! When our neighbor boy, the same age, came over, Matt opened the door and said “Jamie, guess what we have?” Jamie said “What?” Matt replied “A new vacuum cleaner”! The look on Jamie’s face was like “Really, you are excited about that”? Matt would have loved the Dyson toy vacuum! Where did you get your restaurant style high chairs? I would love to buy some for my triplets! So much better looking than regular high chairs! We love these high chairs! I ordered them from amazon. Amazon! We LOVE them, and feel that they’ve made family dinners more peaceful with the quads.